You are currently browsing the category archive for the ‘Arts and Humanities’ category. Artists and arts advocates, who have been outspoken about his frustrations with the Fund for the Arts CEO Allan Cowen, will demonstrate outside the fund’s offices later this week. Complaints about Cowen have increased after a message he left the unsatisfied director of the Louisville Visual Art Association became public. The protest is being organized by artist and gallery operator Craig Kaviar. It will be held from 4:30 to 5:30 pm on Friday. Following a recent flap with Fund for the Arts CEO Allan Cowen and the Louisville Visual Art Association, a group of visual art leaders has begun publicly questioning how the fund distributes money, specifically to visual art groups. When individuals and groups give to the fund they think that they are giving to all of the arts in Louisville, but most people are shocked to find out that all of the visual arts together receive only $203,749, which is 2.56 percent of the total budget. Is this a fair distribution of the limited art funding? The Fund for the Arts board has reiterated that Cowen does not have a hand in distributing money, and the body has taken action to rebuke Cowen. Both Cowen and board chair Ron Murphy have declined to elaborate. The board has further said it will put together a new strategic plan that could lead to a change in how much money certain groups receive from the fund. Recently, the chair of the Visual Art Association called for Cowen to be fired and questioned the value of the new strategic plan. Murphy says the board has already made its decision about Cowen. This is the final weekend for It Takes a Ville, the Actors Theatre of Louisville production put on in partnership with Chicago’s Second City comedy troupe. The show was created by Second City specifically for a Louisville audience. Second City writers Tim Baltz and Ed Furman came to Louisville last year and embarked on a Louisville immersion tour. They spoke to local figures in politics, sports, media (including WFPL’s Gabe Bullard), the arts, business, etc. Afterward, they returned to Chicago to write, cast and mount the show. One challenge the Second City faced in preparing It Takes a Ville is that the show is so Louisville-centric that no one in Chicago who watched the rehearsals got any of the jokes. It was only when the troupe performed in front of Louisvillians for the first time that they had a sense of whether or not the show could succeed. And succeed it has. It Takes a Ville has exceeded projections for ticket sales for Actors Theatre. The final performance is Sunday afternoon at 2:30. The Fund for the Arts will kick off its annual fundraising campaign Tuesday. As reported on WFPL, the campaign begins at a time when many arts organizations are suffering. Fund CEO Allan Cowen says the organizations may need to rethink their size, though the fund will continue to support organizations as best it can. At one point in our interview, Cowen said if there were more money available to raise, the fund would likely have raised it. The Louisville Orchestra’s musicians (Keep Louisville Symphonic) are not pleased with the Fund for the Arts. Kim Tichenor says the fund is neglecting its duties and took a swipe at Cowen’s salary, reported at more than $300 thousand (Cowen defends himself in the WFPL story). Tichenor also says Saturday’s Keep Louisville Symphonic concert raised $50 thousand. The Louisville Orchestra has been granted an emergency payment to meet Monday’s payroll. The orchestra has filed for Chapter 11, but last month a judge ruled that management must honor its contract with the musicians. Last week, orchestra officials said they did not have enough cash on hand to pay the musicians beyond Monday. Rather than risk legal consequences, management sought to borrow funds from about two endowment accounts which total about $10 million. In a statement released Friday, the orchestra said the request was granted, and the musicians will be paid with an advance on future earnings from the endowment investments. It’s not clear how much money was granted and how long that money will last. The funds will not only go to payroll, but also to other costs associated with continuing the season. The season continues through mid-May. The musicians’ contract expires two weeks later. Management has sought to reduce the size and season length of the orchestra. The musicians say a smaller ensemble would not be successful, and have sought to close any budget gaps through increased fundraising efforts. The musicians will play a concert not affiliated with the orchestra management Saturday at Ballard High School. The event is free, but donations to the players will be accepted. Louisville, KY (January 28, 2011)… The Louisville Orchestra announced today that, in deference to the recent ruling of the Bankruptcy Court, it has sought and been granted emergency funding from the “Philharmonic Trust” and the Louisville Orchestra Foundation. Each exist with independent boards and serve as separate legal entities from the Louisville Orchestra. This support will enable the Orchestra to fund its next payroll on January 31. The funding is provided as advances against future seasons’ endowment allocations, and was made possible, in part, due to the sharp rise in investment markets since December. Issues concerning whether any additional funds can be obtained are continuing to be explored. Community members who wish to support efforts to sustain live music and the Orchestra’s programs and services are encouraged to make donations exclusively through the Louisville Orchestra’s website (www.LouisvilleOrchestra.org). Most stories about the Louisville Orchestra’s Chapter 11 filing mention the problems other orchestras are facing. The LO is struggling to make another payroll, and the Courier-Journal has a rundown of what other ensembles have done in similar situations. NPR recently looked into the same thing…So did we. ThinkIndie–the digital music download service run by a coalition of independent record stores–is closing. ThinkIndie offered paid song and album downloads to stores across the country, including Louisville’s Ear X-tacy. 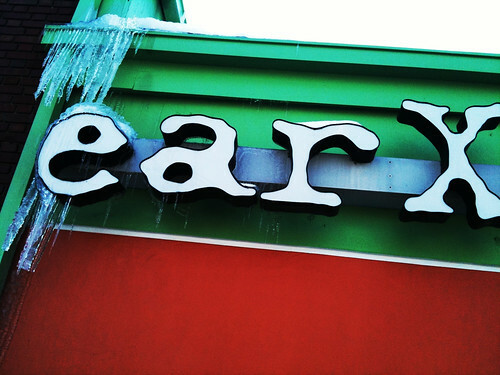 The service will close on February 15th, leaving Ear X-tacy with no download service. But the closure is unlikely to further harm the store. In the past, owner John Timmons has spoken candidly about Ear X-tacy’s financial insecurity, but general manager Rebecca Cornwell says the download service was not a source of profits for the store. Cornwell says for two years ThinkIndie clients poured money into the service without seeing a return, likely due to the ubiquity of larger download services like iTunes and Amazon MP3. Cornwell says it’s unlikely Ear X-tacy will try to keep offering downloadable music after ThinkIndie closes. Rather, she says store management wants to focus on hosting concerts and offering other experiences customers can’t get elsewhere. The ThinkIndie team would like to thank you for your support and patronage of the site and independent music stores. Unfortunately, ThinkIndie will discontinue selling digital downloads as of February 15, 2011. Upon closure, we will delete all account and credit card information. Please use all outstanding credits before the closing date. All mp3s previously purchased from ThinkIndie will be unaffected by the closure. The orchestra has filed for Chapter 11. Last month, a judge ruled that the musicians must be paid. That also means that as long as the musicians are paid, they will play their regularly scheduled concerts. But there’s more. Keep Louisville Symphonic will launch with a concert on the 29th of this month at Ballard High School. Former Louisville Orchestra artistic director Uriel Segal will return to lead the performance. Tickets are free, but donations to Keep Louisville Symphonic are encouraged. Tichenor said that the Keep Louisville Symphonic organization, which had its first organizational meeting and has had a tax-exempt status transferred from a pre-existing group, is an audience-centered organization. Its mission is to activate the collective energies of the Louisville community to preserve, protect and extend the inspiring and enlightening capacities of symphonic music for the city. In addition to what Tichenor envisions as once-a-month public concerts, the musicians have also committed to be involved in a grass-roots fundraising campaign to obtain additional donations to support the city’s orchestral arts.